Are over-the-range microwaves a good choice, especially for high-powered gas ranges? I remember seeing the first over-the-range microwave in 1986. I thought it was a great idea. You could centralize your cooking with a microwave over the stove and not have to pay for hood. It looked good and matched the range. However, due to changes in ranges and kitchens in general, I am wondering about the viability of this product. Let's take a look at the product and industry changes, and explore possible alternatives. The over-the-range microwave has not changed much since I first saw it back in 1986. The typical specs are 16.2", 16.375" deep, and 30" wide to match the range. The CFM (how many cubes of air is exhausted in a minute) is 300-400 on the average side. 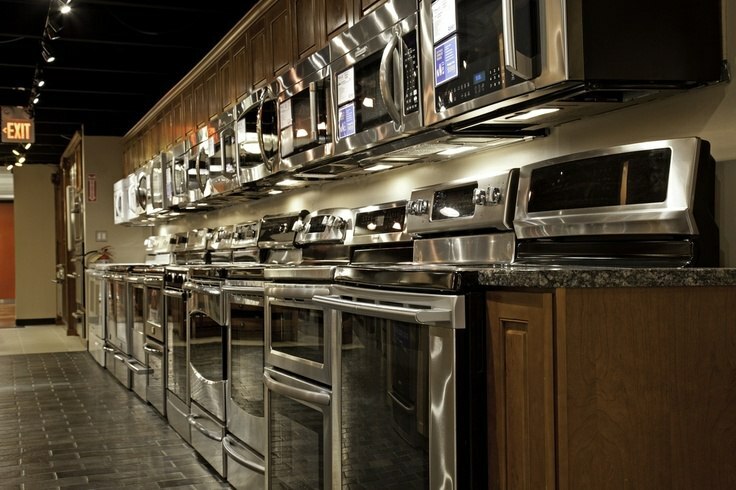 Most range hoods are 300-695 CFM's for a standard gas range. It was an adequate ventilator for a typical stove designed in the 1980’s and 1990’s. However, it is not a product capable to exhaust grills, woks, or professional ranges (sorry Viking, it will NOT work), because there is little depth or capture area. Smoke is never immediately filtered. It is captured and then channeled through the duct to the outside. The average hood is 24" in depth whereas the OTR is only 16". That could be a venting issue on a more powerful range. At the same, gas ranges have changed quite a bit. The average BTU burner on a gas stove was about 10,000 BTU's. Most ranges now have at least one or two burners of 15,000 BTU or greater and the average BTU of a gas range has increased dramatically over the last 10 years. So the real question is: Can an over-the-range microwave handle these gas ranges? First, you are probably not going to burn down your house with an OTR. However, you will not exhaust properly if you love to use the top of your range. There are now alternatives to the over-the-range microwave for the avid cook. 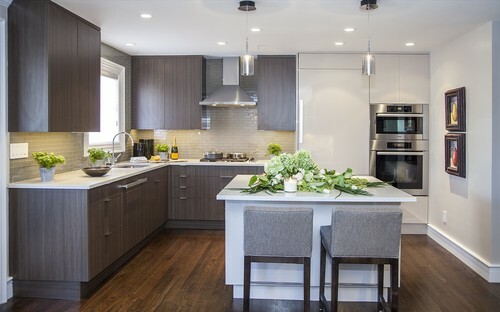 Over the last 20 years, the kitchen has evolved from a single, small room to a great room encompassing the once formal dining room and kitchen. This new great room has opened new alternatives to place your microwave. 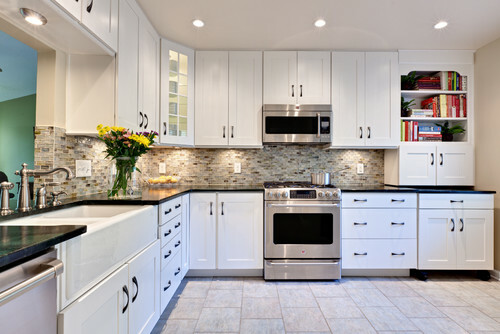 Microwave drawers slide out with a touch of a button and are great in spaces like islands and cabinets. Microwave drawers are all produced by Sharp. But with brands like Jenn-Air, Thermador, and Bosch, they are better-looking and can be mounted flush to your wall. Speed ovens are really convection microwaves. They have the ability to cook as a microwave, convection oven, or both. 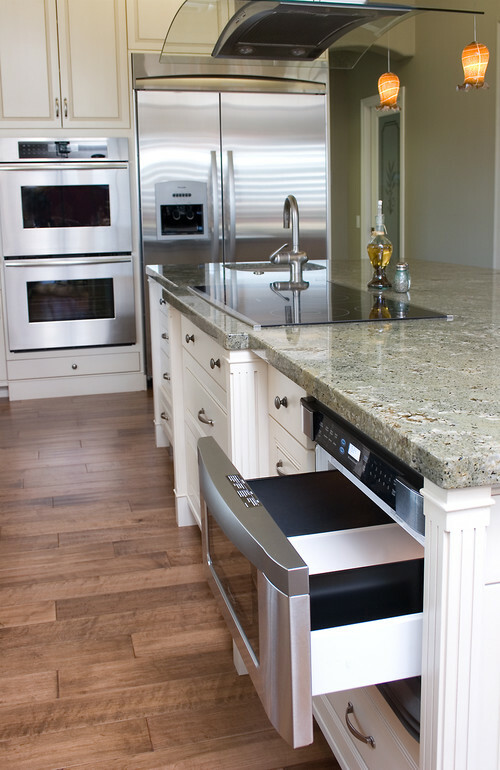 Speed ovens can be placed anywhere unlike microwave drawers, because they fold down and do not slide out. The more powerful 220 volt products need to be placed in a wall cabinet. You can really cook in a speed oven. The best is Miele, because the controls are so easy to use. Jenn-Air, Kitchen-Aid, and Bosch Benchmark have a decent product as well. 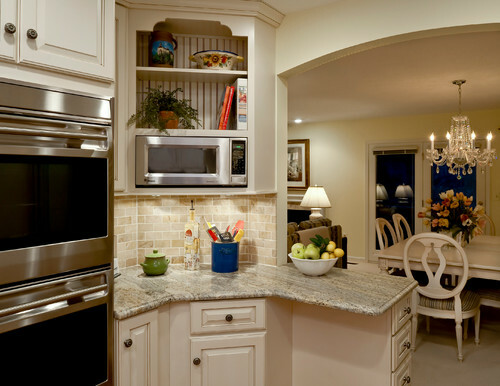 GE has a 12-inch deep microwave designed to be placed under a cabinet. It is a bit dated looking, but not bad as a last resort. You can also build it into a cabinet (just use a trim kit, not shown below). I still like the OTR. However, you should look at alternatives if you like to cook. You will be buying a new range of 55,000 - 60,000 BTU’s in the future. The OTR does not have sufficient capability to handle all that smoke, grease, and heat with every burner turned on. However, there are suitable alternatives if you plan your kitchen accordingly. Get the Yale Ventilation Buying Guide with features, specs and how to vent any range properly. Well over 100,000 people have read a Yale Guide.